(Southern Metropolis Daily) Veteran Journalists Confess To Directing Photos. March 19, 2008. Li Zhencheng graduated in 1963 from the Department of Photography of the Changchun Academy of Cinematography and later became a photojournalist at <Heilongjiang Daily News>. In the 1980's, he went to teach at the Department of Journalism at the China People's Police University. 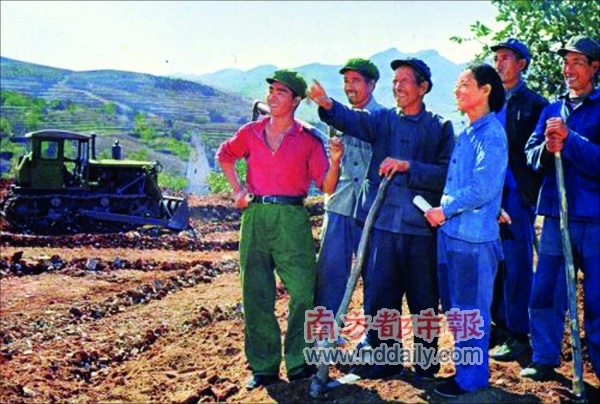 As a professional photojournalist, he had taken and preserved a large number of Cultural Revolution-era photos with the unique characteristics of those times. On March 7, Li posted a photograph titled: <Yet Another High Quality Well> on his personal blog. He stated in very clear terms that this photograph had been directed and modified 35 years ago. "From the viewpoint of composition and lighting, this photo is quite perfect. In reality, there are many places in which modifications and forgery occurred. Back in those days, I was all for reasonably organization and modification. I advocated direction and alteration without giving any hints." Li challenged his blog visitors to detect the flaws. Netizens began to detect problems such as the lighting on the window frame on the top, the suspension of the telephone in mid-air and the unnatural lighting on the face of the man, etc. On March 15, Li Zhencheng published the answers. He said that the netizens were praiseworthy for their perceptions. He said that he used two light bulbs in order to create the brilliant lighting effect. The telephone was suspended in mid-air by wired attached to the window. Later on, he had cropped the bottom of the telephone and the top window frame. "I entered the cropped photo into the Heilongjiang and the Northeastern Provinces photography exhibitions. No judge ever complained about the faking. No one has ever complained over all these years. This essay caused Xu Lin to reflect. Before his retirement, Xu Lin had been senior editor, art director, photograph editor, photojournalists and text editor during various times at <People's Daily>. He had designed the front page of <People's Daily>. After reading Li Zhencheng's essay, he began to disclose his own personal experiences on his own blog. Previously, he had made various reflections and self-criticisms within the photography profession context, but now he is discussing his own record on his personal blog. From March 17 on, Xu Lin began the series <Review and Self-criticisms of 40 years of photojournalism>. He wrote about his history in photojournalism and publicly criticized himself for directing the "perfect" photos. "I watched how other people directed their photos and I imitated them. I thought that the effects were great and I got used to doing it. Although I was deep in the mud, I was quite happy. During that period, I was deeply interested in directing. I learned from others and I researched, analyzed and evaluated myself." Xu showed samples from his notebook. Middle photographs: In such photos, attention must be paid to make sure that the people do not overlap each other. Whether the trouser legs are folded up will also lead to different effects. Xu was especially interested in photographs of groups of people. His notebooks were filled with entries such as: "Where should the principal characters be positioned" and "the clothes of the principal characters should distinguish them from the other characters." 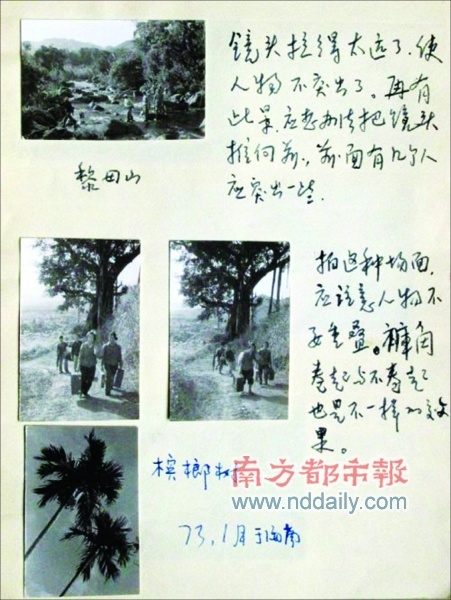 In one case, Xu Lin had explained how a particular photo was directed, but his editor altered his text. "From this, we can see that the China Photography Association and <China Photography> magazine were wary of the obvious directing in photojournalism and documentary filming at the time." Nevertheless, these photographs continued to be published. 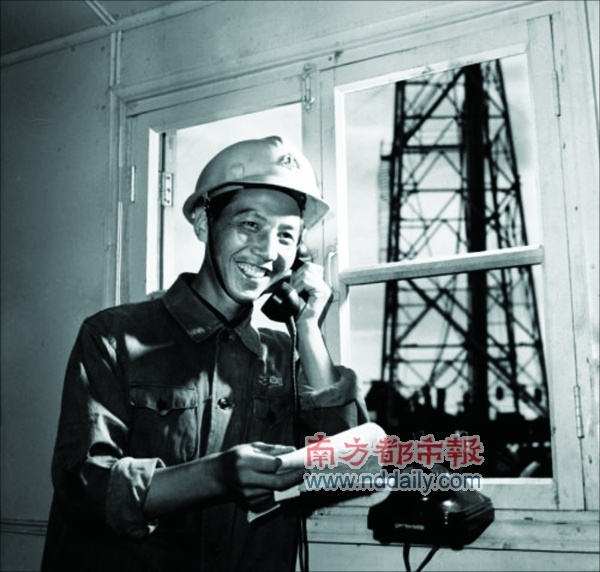 Xu Lin: March 1975, Shengli Oil Field (Shandong), <Learning The Theory of Continual Revolution Under The Dictatorship of the Proletariat>. "I personally wrote the poster of Chairman Mao Zedong's sayings and then I posted it on the wall in a position that I chose." 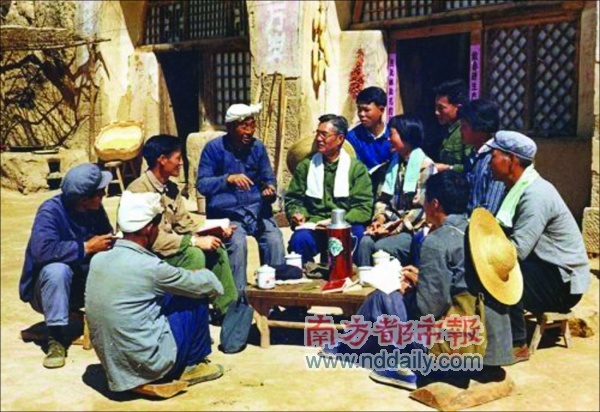 Xu Lin: October 1975, Zunhua (Hebie), "The Unity of the Old, Middle and Young"
Xu Lin: May 1974, Nanniwan (Shaanxi), <Nanniwan May 7th Cadre School>. "In this set, I paid great attention to the small details: the headwear on the old peasants, the straw hat at the back of the person, the notebook in the hands, the towels around the neck, the water bottle and glasses on the table and, the positions of the people ... this was not photojournalism! This was play-acting for the camera!"